PowerMedic offers, as one of the largest lasers in the world, the GigaLaser. 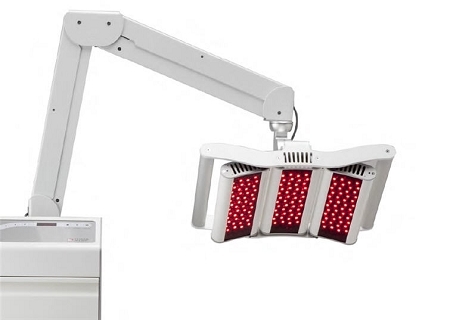 This lasers is perfect for the patients that needs treatment over large area of the body, such as the back, hip or leg. The screen itself can be adjusted individually since it is divided into three separate sections. This makes it easy to adapt to the treatment area. Capable of delivering over 2000 joules per minute, this system is perfect for back pain and treating other large areas. The advantage of the GigaLaser is the laser is able to treat a larger area therefore reducing the treatment time. The provider has the option to be present during the treatment or perform another treatment (e.g. acupuncture) simultaneously. This drastically frees up the provider's time if they need to be in another room during treatment. The GigaLaser provides 6 predefined protocols and an easy to use touch screen helping the provider to go between protocols, if needs be, quickly and easily. The laser is designed to be able to go from room to room with ease. The GigaLaser has been FDA approved for following treatments: muscle relaxation, increase blood circulation in local areas, minor muscle and joint pain and stiffness, muscle spasms and minor arthritic pain. Safety Lockout: Turn key required to start unit. This product is considered over-the-counter, and there is no medical supervision required to purchase this product. This product is sold for human and animal applications to health care providers and home users. This product can be sold to any trained health care provider. It can be sold to home users for use on pets and horses. In order to buy this system for home use on humans requires a recommendation from a trained health care provider. Most home users get a letter or email from a chiropractor, acupuncturist, herbalist, physical therapist, or trained massage therapist recommending the purchase of a laser or laser therapy. This product does NOT require a prescription from a licensed MD. This product can be sold to any trained health care provider or home user that meets these minimum requirements. 4 This product is sold to professionals only (for use on humans), not because of FDA requirements but because the product requires advanced training for safe operation. Some products may be sold to non-professionals for use on pets and horses. This requirement is established by the manufacturer.